When my super-natural revelations started in 2007, Father-God's instruction was very clear. "Go and tell My people - Also write it down in book form, simple enough that everybody can understand." Thereafter I was first taken to the dark places where satan and his followers reign. Accompanied by an angel and surrounded by Father's presence in the form of a tube of light, I had to learn more about the strategies of the powers of darkness. After these terrible experiences I met Jesus and my preparations for Heavenly revelations started. "I want to spoil you, I want to take you to Heaven," He one day said to me. 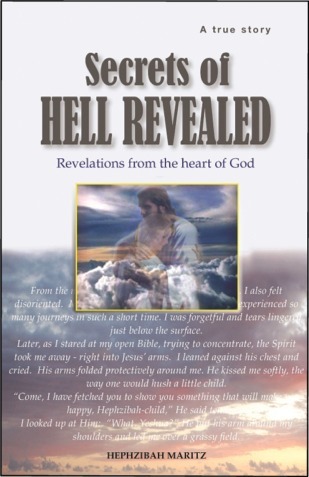 All these revelations have been recorded in "Secrets of hell revealed".